Father John F. Kennedy died on April 23, 2013 at St. Teresa’s Residence, Maryknoll, New York. He was 84 years old and a Maryknoll priest for 57 years. John Francis Kennedy was born in Great Neck, New York, July 5, 1928, the son of John and Helen Gorman Kennedy. He has one sister, Margaret. After graduation from Sacred Heart Elementary School in Bayside, New York in 1942 and Cathedral College High School in 1948, he entered Maryknoll in September, 1948. He has a B.A. from Maryknoll Seminary, where he was ordained on June 11, 1955. Immediately following his ordination, Father Kennedy was assigned to Taiwan. After one year of language study he was sent to Lo chu and a year later to Lam tau. Then he was in Ji lim for almost 10 years. Father spent all of his mission years in his beloved Taiwan. He did parish work mid-island for the first 14 years. Then, after 6 years as Regional Superior, he was appointed Pastor of a parish in Taipei where he established Friendship House for young workers and the Catholics who had moved to the capital city of Taipei. A strong emphasis was placed on the use of the native dialect, Taiwanese. He was there just under 5 years. Father Kennedy moved to Taichung in 1973 when he was elected Regional Superior of Taiwan for two terms from 1973 to 1979. He was also chosen to be a Delegate from Taiwan at the Sixth General Chapter in 1972. In 1980 he started Friendship House South in Kaohsiung. This center has the same goals as the earlier one in Taipei and depends totally on the cooperation of volunteers to achieve them. It is an outreach to all workers. Although assigned to the Retirement Community in January 2011, Father Kennedy continued in the Young Workers Apostolate in Kaohsiung Diocese until his return to the United States in the fall of 2011, when he moved to Mission St. Teresa’s at Maryknoll, New York. According to his wishes, Father Kennedy’s body has been donated to New York Medical College. A Memorial Mass was concelebrated in Queen of Apostles Chapel on Tuesday, April 30, 2013 at 11:00 a.m. Msgr. 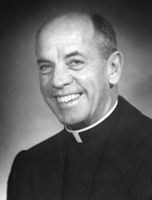 John J. Casey was Principal Celebrant and homilist.